Here’s the Interview by Connie Mettler. Be Totally Inspired by Mckenna Hallett’s Motivational Insights While Creating in Your Studio Today! This interview is worth every minute. There are nuggets in here that are 24K solid gold for helping artists sell more art or, as Mckenna says, “find loving homes for your art”. She is captivating. And having read the guidebook, I thoroughly recommend it. If you are doing in-person sales, this can ONLY help you. Mckenna has been selling art for many decades. The system she shares shows us a whole new attitude. Her passion is obvious in the interview and her loving approach flows through every page of the guidebook! If you don’t have time to listen to the interview, then just buy the guidebook. It will make a big difference at your very next event. Tips, Hints, and other Hugs for Artists Selling Face-to-Face! Start your 2017 Show Schedule with a new approach. Take time to align your art and heart and find out what love’s got to do with it! Need more convincing? Everything you need to know is here! Or check out this video that says is all! I felt compelled to write you another testimonial. Please share wherever and however so artists will see this. I sell my art at many events. I go in phases where after I set up I read McKenna’s card pack and the exit check list. Sometimes they are immediately helpful, some days are just slow or I am uninspired and the cards perk me up. I have probably read those cards 40-50 times. And I often think, do I really need to remind myself of these ideas? Then at a recent event a man and I were discussing the purchase of one of my paintings and although he truly wanted the painting he was scared. As he talked to me about other types of purchases he has made one of McKenna’s cards literally flashed before my eyes…. It suddenly became easy and fluid for me to engage with this man who did shortly afterwards buy his first original work of art which will grace his life for many years to come. 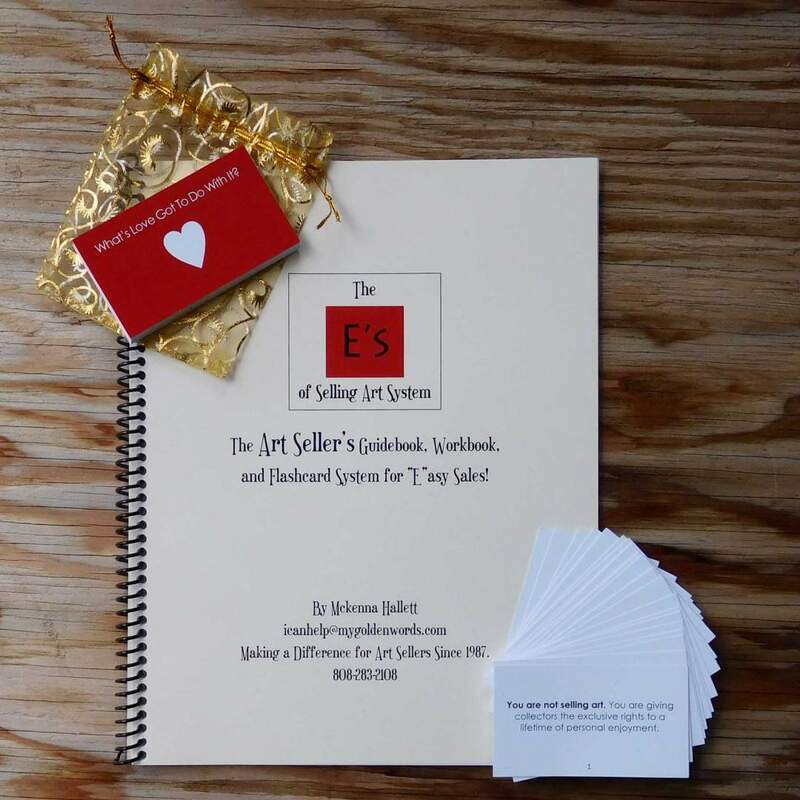 Without reading those flash cards over and over, even when they did not seem to affect my immediate sales, the ease and confidence I felt in this sale would not have happened. Read FAQ's and More Testimonials!